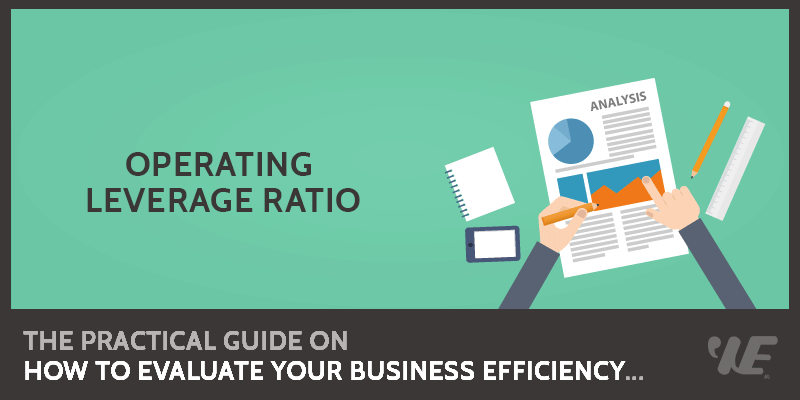 This is a complete guide on how to calculate Operating Leverage Ratio with detailed example, interpretation, and analysis. You will learn how to use its formula to evaluate a firm's efficiency. Definition - What is Operating Leverage Ratio? The operating leverage ratio is basically the ratio of fixed costs to variable costs. Its main purpose is to calculate where a company’s breakeven point is. However, it can also indicate the potential for increasing profit. If a company has a high operating leverage ratio, it may mean they simply need to utilize their current assets more fully to increase profits rather than increasing spending to increase profit. The formula for the operating leverage ratio is a simple one. You first need to subtract the company’s variable expenses from their sales to get the numerator. Then, divide that by the operating income. The resulting number will be the percentage that tells you about how much your operating income will increase for every increase in revenue. Company ABC has earned $5,000,000 in sales after selling 1,000,000 products at $5 each. This gives the company an operating leverage ratio of 7.6. In other words, if the company increased its sales by 10%, it should be able to increase its operating income by 76%. It’s not as straightforward to determine whether any given operating leverage is high or low on its own. You would need to do a comparative analysis between different companies in the same industry. This ratio is also more effective for comparing two different scenarios. For example, a company might be considering outsourcing part of its manufacturing in order to cut down on variable expenses. Doing an operating leverage ratio analysis of the company’s current situation compared to what it would be if this portion of manufacturing was outsourced would help to understand if the change makes financial sense. One of the trickiest parts of calculating the operating leverage ratio is that you need to accurately separate fixed and variable expenses. Certain “variable” expenses like wages are not really variable in the short term. If you aren’t sure whether to categorize an expense as variable or fixed, it’s safer to just lump it in with fixed expenses. Moreover, while a high operating ratio indicates that a company can dramatically increase profits with just marginal increases in expenses, it’s not always that simple. That same high operating ratio also puts them at risk from poor decisions or bad leadership. A marginal decrease due to poor decisions could lead to dramatic decrease in revenue and profits. So, in short, this is a ratio that can have a fairly large margin of error, rendering it too inaccurate to rely on. And even if you have an accurate estimate, it doesn’t guarantee that the company will be able to take advantage of its potential. It can be a useful indication of how well the company is currently positioned but you definitely need to be careful.